Production Dates: c.1944 – c.1982ff. Location: Quebec, Montreal, Rimouski, North Hatley, Quebec. Types of Work: Mostly Functional but with many with sculptural overtones. Preferred Clay: earthenware and stoneware. Gaétan Beaudin. 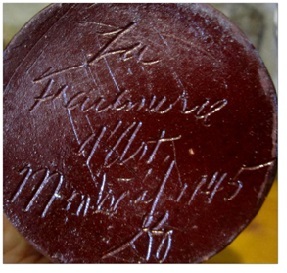 Signature La Faïencerie d’Art Montréal 1945 GB. Artist, philosopher, engineer, geologist, teacher. These are some of the words of the many sides of Gaétan Beaudin. They do not do him justice. Although he was not the first studio potter in 20th century Quebec his name and his impact are first on today’s artists’ lips. Further, his struggle in overcoming the conditions existing in his early years are a testament to his perseverance and commitment. 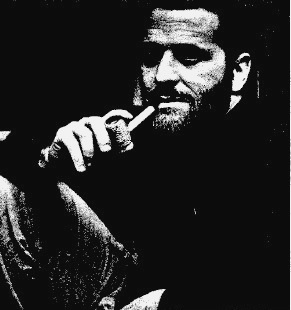 Yet part of his success came out almost by accident and a bit of serendipity; and in spite of his success and influence he was always questioning whether he was on the right path. The public’s concept of “craft” did not develop until years later. For many years his work was sold as one-of-a-kind in gift shops. ¹ There is an irony in that later in his career Beaudin would be designing and making “factory” dinnerware. Gaétan was feeling insecure about having only one client. ¹ Then Rimouski happened. He received federal funding to set up classes and a workshop. From that period, 1946 -1953, come some of the most widely known collectibles of his work, the Décor Rimouski style. More students came to North Hatley, four to six students a year. Maurice Savoie 8 mentioned that Beaudin did use Leach’s “A Potter’s Book” and for a while lost much of his trade as a result. Leach, it seems was not the guru for Quebec as he was for others in Canada. Perhaps this is more a reflection of his continuing personal quest for meaning and direction in his own work. still he gives glimmers of hope for the future; in the article we have our first mention of and praise for Enid Legros among others. Nonetheless, he seems to have taken the long view in his belief in the need for quality Québec ceramics and continued at the school until 1973. He also worked on boards as an advisor to the government on crafts and industry. The word ‘sial’, by the way, is a geological term referring to the upper part of the earth’s continental crust and reflects Beaudin’s interest in matters geological. Gaetan Beaudin in Rosemere, QC. courtesy of Julie. It is an understatement to say Gaétan Beaudin had a major technical, aesthetic and social impact on Quebec ceramics. His material studies, his experiments in harmonizing art and industry, and his teaching so many future Quebec ceramic “greats” is unparalleled. He is remembered and honoured more recently and officially by the Prix Gaétan Beaudin and by the Galerie Gaétan Beaudin, Val-David, Quebec. Beaudin’s work covered a range of styles from an almost folk art to biomorphic to Scandinavian, to Japanese, to industrial. Vase, 1945. Signed, “La Faïencerie d’Art Montréal 1945 GB”. Beaudin’s early works were simple earthenware, red fired, red glaze, firing as close as possible to vitrification, sometimes to cone 08, depending on the clay. They were covered with an additional transparent lead glaze and engobe. He called it naive but plain and honest earthenware. ¹ This is a particularly ornate piece with a landscape motif of trees and flower flowing around the belly of the pot. Gaetan Beaudin1945. Jug,signed “La Faïencerie d’Art Montréal 1945 GB”. Photo Collectoboce. L’Association des collectionneurs de céramique du Québec. Jug, 1945. Red earthenware. Signed “La Faïencerie d’Art Montréal 1945 GB”. This simple and heavy creamer has a traditional, rustic quality. Its overtly wheel-thrown marks on an undulating belly, its flared mouth, and attached open handle contrast dramatically with his next phase, Décor Rimouski. Images of this important period of Beaudin’s production are shown courtesy, canadiana – important canadian design with photos by Tilai Ellis-Stairs. Décor Rimouski Creamer, 1946-53. 13.5 x 8.9 x 7.6 cm. The designs from this period are three dimensionally complex, with multiple layers of curving forms. More than one image is required to give a hint of their true appearance. The glaze is smooth, and glossy, essentially blemish free with a more industrial look than artisan. Although the basic form of the creamer is standard there are now ergonomic considerations in the double spout and the off-kilter handle. The handle is now showing signs of closing in to the body of the pot and seems to flow organically from its connection to the base of the pot. Décor Rimouski Sugar Bowl. 1946-53. 10.2 x 11.4 x 8.9 cm. The forms have a similar, standardized look in glaze colour and handles to the creamer above. There is an organic flow throughout such works. The look is “modern” unlike anything seen in Quebec at the time. Décor Rimouski Cup and Saucer, 1946-53. Cup, 5.1 x 12.7 x 10.2 cm; Saucer, 2.5 x 22.9 x 16.5 cm. Beaudin used his “free” time in Rimouski well. The transformation from his earlier Montréal work is quite amazing. Gone are the heavy forms and decorated surfaces. They have become smooth, even, and organically flowing. They have been called “biomorphic” and “free form”, and are reminiscent of the flowing, sculptural forms of Jean Arp and the folded amoebic forms of the Surrealists in their modernism. Décor Rimouski Mugs with Integrated Handle. These works reflect Beaudin’s interest in harmonizing human and ceramic forms, creating an integration of use, design and industry. While in Rimouski Beaudin had much time for research to explore design and production concepts. Such works are now much sought after collectibles. 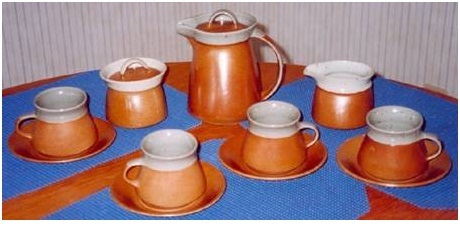 They were produced for years after he left Rimouski under licence to Laurentian Pottery. 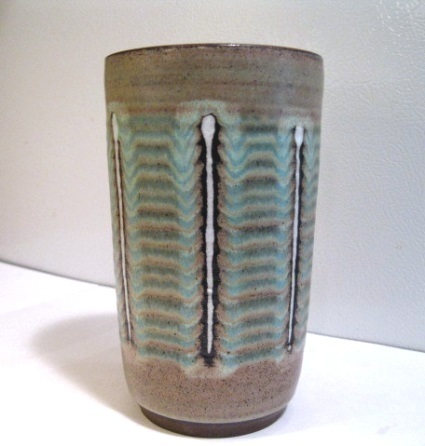 Gaétan Beaudin 1955 Noryth Hatley Vase. The work shows a distinctive Scandinavian simplicity of form. This and the engobe decoration is typical of much of the surface design work produced by Canadian potters of the time. The contrast with Décor Rimouski is dramatic. Gaetan beaudin 1956 – 7 . 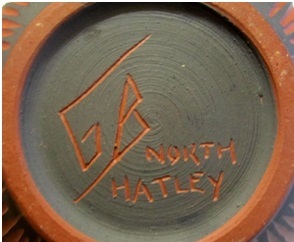 North Hatley blue vase. Photo Collectoboce. L’Association des collectionneurs de céramique du Québec. Blue vase c. 1956-7. This vase is similar to the type of Beaudin’s works listed in the Canadian Ceramics 1957 exhibition catalogue, shown at the Royal Ontario Museum, Toronto, and the Museum of Fine Arts, Montreal, and organized by the Canadian Guild of Potters and the Canadian Handicraft Guild. He had obviously reached out beyond his Quebec roots. All four of his included works are earthenware; three are listed as works in shades of blue glaze. By this time Canadian ceramics had achieved a recognition that went beyond sites such as the Canadian National Exhibition and gift shops. Bowl, 1954-73. North Hatley. Collection of Gilles Derome. The simplicity of this earthenware bowl and its linear surface pattern reflect Beaudin’s sense of strong form. Hand made it still shows a hint of his sense of industrial design seen in earlier years in Rimouski. Gaétan Beaudin, 1961. 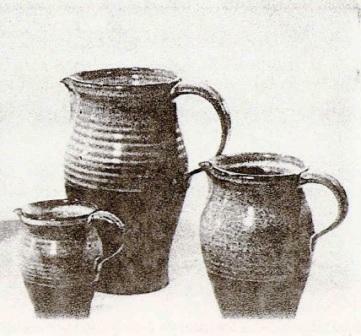 Set of Glazed Pitchers. 1961 Canadian Guild of Potters Exhibition. 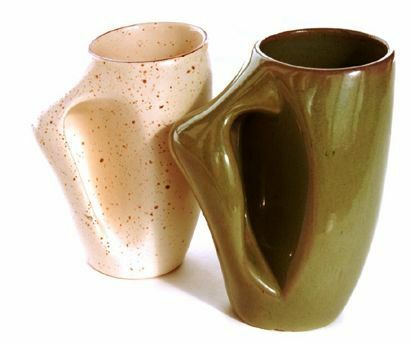 Set of Glazed Pitchers, 1961. From the 1961 Canadian Guild of Potters Exhibition. By contrast These Beaudin works show their wheel thrown origins. They are fairly conventional, traditional, probably earthenware. Although reminiscent of his much earlier student days in Montréal the works are now more accomplished finer of form and proportion, with a lighter feel. By 1965 he had moved into stoneware. 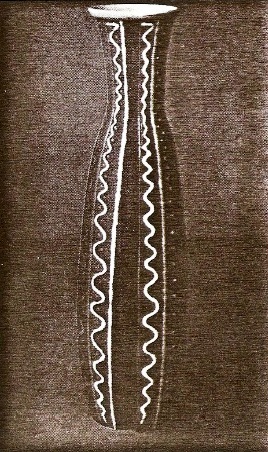 Long Necked bottle, c. 1965. Probably stoneware.The formal influence of Japan is quite evident in the form of this square, long-necked bottle. It was exhibited in la Galerie le Tournesol which opened August 15, 1965. 7 The shop, which he opened with 10 other artists, was on Mountain Street. After his Trip to Japan Beaudin’s work begins to display form and glaze elements reflecting his Japanese experience. The form is heavy, sturdy, almost minimalist in effect. The work looks like a two piece construction: slab or handbuilt box base with a wheel thrown neck luted to the box base. 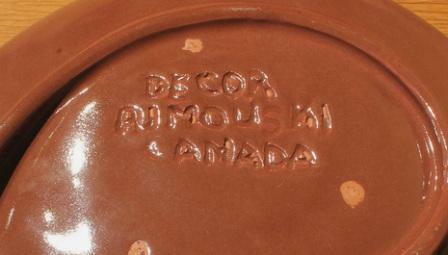 Catalogue listings such as the 1965 Canadian Guild of Potters exhibition refer to such works as Bizen ware with goma technique, reflecting a reddish brown, hard ceramic form without glaze, with traces of molten ash. Vase, 1954-65. Simple forms are a characteristic of Beaudin. Here he uses broken, horizontal bands of grey-blue glaze, with a feathered effect, separated by vertical strips of white and black glaze. The overall pattern creates a rhythmic and pulsing, laddered effect that enhances the vertical movement of the form. The foot is bare showing a speckled red clay surface. 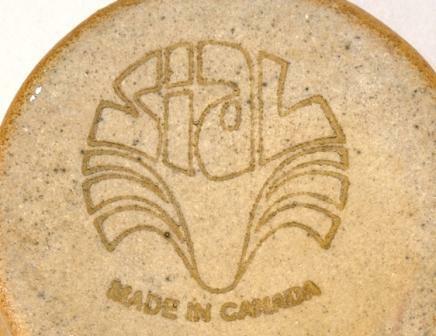 SIAL was started in 1965 to provide a supply source of clay and glaze materials for Quebec ceramists. SIAL II started in 1973 was an ‘industrial” pottery created to mass produce stoneware dinnerware. Such works are much sought after on the secondary market. Gaétan Beaudin, c. 1976. SIAL II Oval Dinner Service. 1. Gaétan Beaudin. 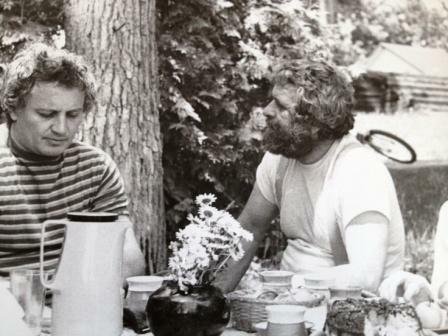 Interview with Barry Morrison, July 25, 1981, Montreal. 4. Parmalee, C.W. Ceramic Glazes. Industrial Publications, Inc. Chicago. 1948.; Andrews, A.I. Ceramic Tests And Calculations. John Wiley and Sons, 1928; and Brick and Clay Record, Windsor and Kenfield, University of Michigan. 6. Cogné, Daniel. Projets de Recherche En Céramique Québécoise (Première partie). 7. Antique Promotions Website . Page on Gaetan Beaudin. This site is a goldmine for information on all aspects of Québec ceramics. 8. Maurice Savoie. Interview with with Barry Morrison. 10. Ayre, Robert. Ceramics in Canada. Studio, vol. 154 #777, December 1957, pp. 168-75. Ayre mentions only four ceramists of the period: Louis Archambault, Jean Cartier, Françoise Desrochers-Drolet, and Claude Vermette. Functional pottery in Québec was below the the radar of critics and writers of the time. I enjoyed this biography but was very disappointed that there was not a section on his later life. 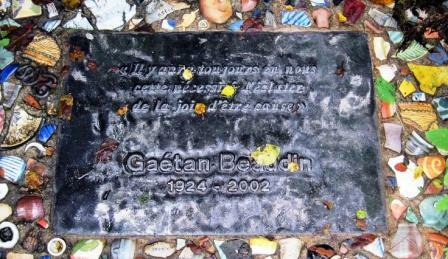 I met Gaetan in Nevis in the early 90’s. He was not a happy man .. Drinking at the fountain of his superior intellect, broadly educated mind, he and I became very good friends spending endless hours discussing many different subjects, sometimes heatedly. His interest in potting reemerged; I financed a studio, materials and a kiln of his design where he worked both potting and particularly on glazes that had the same coefficient of expansion as the clay allowing for a single firing. He was not a very good teacher in those days and I was not a very good student but he was an unforgettable friend. Jim, I agree on your disappointment. It was hard to have to stop the article so early. Sources on Beaudin’s later life and work just seemed to dry up. One of the purposes of this website is to fill in the holes of artists lives and production. Would it be possible to connect with you to explore his later life and work further? I’ll contact you by email also to see if this can be done. Many thanks though for the hints on the man and his work as you knew him.